We've all heard that breakfast is the most important meal of the day. Do you ever just wake up and want a yummy smoothie instead of having to make a full breakfast half asleep? I know I do! Making sure you get a quality breakfast is a must. Studies show that eating breakfast helps you concentrate and focus better, eat less and can prevent overeating throughout the day. When you eat breakfast, you activate the thermogenesis process and thus stimulate your metabolism. Plus, studies have shown that eating a meal in the morning boosts your metabolism more than eating the same meal in the evening. Regularly eating breakfast can help you lose weight, improve your mood, and even help ward off disease. Here are 10 healthy breakfast smoothies that will kick off your day and successfully help you achieve weight loss. This shake is filled with protein and the oatmeal, on the other hand, is low in cholesterol. A perfect combination for breakfast and adding Chia seeds let it give you extra nutrition and protein boost. Adding Chia seeds on your Pina colada can make it highly nutritious and tasty. 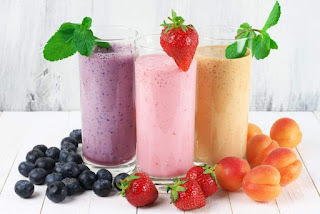 A tasty breakfast smoothie that can give you extra energy and helps heart health. Adding spinach on berry smoothie can make you a drink full of potassium, calcium and can help boost metabolism.